Knox Contour Race Motorcycle back protector. Torso length 510mm. Width 74-120cm. The Knox insert chest protector is designed to fit every Safety shirt, vest and gilet in the Knox collection. Designed and manufactured in Britain by Knox. Body moulded to give maximum coverage and is ultra lightweight and comfortable. Knox Armoured Shirt. Washable shirt with removeable armour. Armour for Chest,elbow/forearm,shoulders and full length back protector. Cool to wear as under jacket armour. Knox Defender Shirt, WORN ONCE, XXL, Black & Grey, CE Shoulders, Elbows & Back. 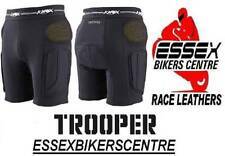 KNOX PROTECTIVE SHORTS ARMOURED MOTORCYCLE MTB MOTO ETC SIZE XS (approximately 28 in waist - . https://www.revzilla.com/knox-size-chart. Good used condition. I believe these are the older Defender model (the armour has changed on the later ones). CE removable armour on hip, thigh and coccyx and padded seat. Popper and zip fastening. Designed for motorcycling but good for MTB, moto-x, snowboard etc. KNOX C.E. APPROVED ARMOUR. 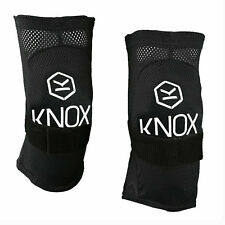 1 SET OF 2 Knox part #45 PROTECTORS ( can be used for ELBOW or SHOULDER or KNEE PROTECTORS). 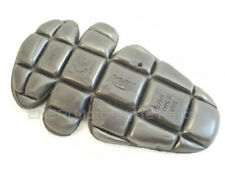 THSES ARE THE KNOX AIR-V2 PROTECTORS. THIS IS A UNIVERSAL FITTING SET AND SHOULD FIT ANY TEXTILE OR LEATHER JACKET OR PANTS THAT HAS INTERNAL ARMOUR POCKETS. Includes removable Knox MICRO-LOCK CE approved back, shoulder and elbow body armour. The Action shirt is designed as an interchangeable layer to be worn under a jacket and is part of the Knox Layering System. Knox Mens Action Shirt - Official Knox store. The Kompakt is our lightest, back protector. Back protector designed and made in Britain by Knox. Motorcycle armour best for touring due its roll away design and sports bag when travelling. Also perfect for winter sports due to its portable, lightweight and flexible design. KNOX Kenton Mens Waterproof Jacket Black Brand New Unworn Gift. All seams are fully seam sealed for 100% waterproofness and the Kenton can be resized to fit on or off the bike Via Knox dual fitting system. The Kenton is a fully waterproof mid length Jacket with a classic tailored fit and minimalistic details. Knox Advance X Impact Protectors are made from a 3 layer construction with a unique polypropylene honeycomb inner core that is covered in soft PE foam. Knox Advance X Part 106 Back Protector. Knox Advance X Part 106 Back Protector. New Knox MICRO-LOCK back and limb protectors are the softest, most comfortable protectors Knox has ever made and totally contour to the body. Knox MICRO-LOCK uses SMART technology and properties to keep the armour super soft to touch but it locks when impacted. Highest performance and ultra light so you forget you are wearing a back protector!